The Pediatric Anesthesiology Fellowship Program is affiliated with the Department of Anesthesiology at the University of North Carolina School of Medicine and UNC Hospitals. We received ACGME approval for the fellowship in 1999. The fellowship program is centered in the North Carolina Children’s Hospital. We currently accept three fellows per year into the program. 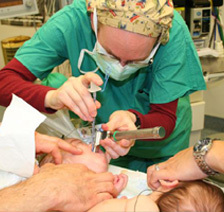 The Pediatric Anesthesiology faculty consists of a group of 14 fellowship trained and/or double boarded Pediatric Anesthesiologists. We provide care to over 10,000 children per year in a very collegial and supportive environment. Our case load includes open hearts, neurosurgery, transplants and typical neonatal surgeries. Our fellows are an integral and important component of our program. We have excellent didactic programs and mentors to assist with research and other academic pursuits.